Almost as soon as we booked our flights in and out of Rome, I realized two days was a very short amount of time for one of the most famous cities in the world. It seems that most people and guidebooks recommend three or four days, and sometimes even five. So I knew that we had our work cut out for us to see the city in just two! We decided to see things that fall in the "ancient Rome" category one day, and things that were in the Vatican area on the other day. This made sense to us geographically and kept us from doing too much retracing of our steps, and it also helped us separate things out in our minds. We arrived to our hotel, Gigi Holiday, which I found on Hotels.com and found had very good reviews on the booking site as well as on Trip Advisor and for $43 a night, we couldn't beat it. It was a quaint, family run place that was quiet, clean, had a nice breakfast, was close to the train station where we caught a bus to and from the airport, and we even had our own bathroom (not always common in cheap hotels around Europe we've found), so I'd definitely recommend it if you're looking for something in that price range. So, without further ado, ancient Rome! From there it wasn’t far to the Forum, which was our next destination. 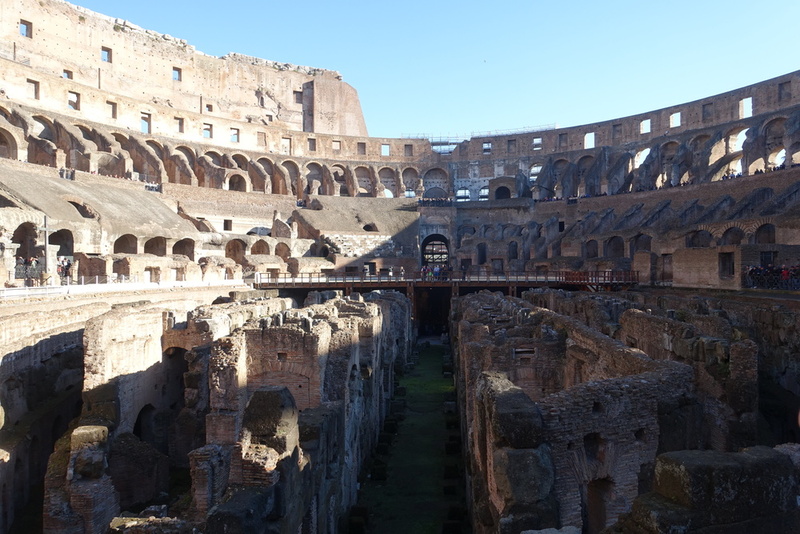 However, we had quite a bit of trouble finding the ticket office, and ended up circling around the Forum itself a few times trying to figure out just what we were looking for. Not bad scenery in the meantime, though. We eventually bought our Forum + Colosseum combo tickets (lines at the Forum are usually quite minimal, we hear – this was our experience as well – however, they can be out of control at the Colosseum, and if you have the combo ticket, you can skip the line and go right in) and started walking around the Roman Forum. 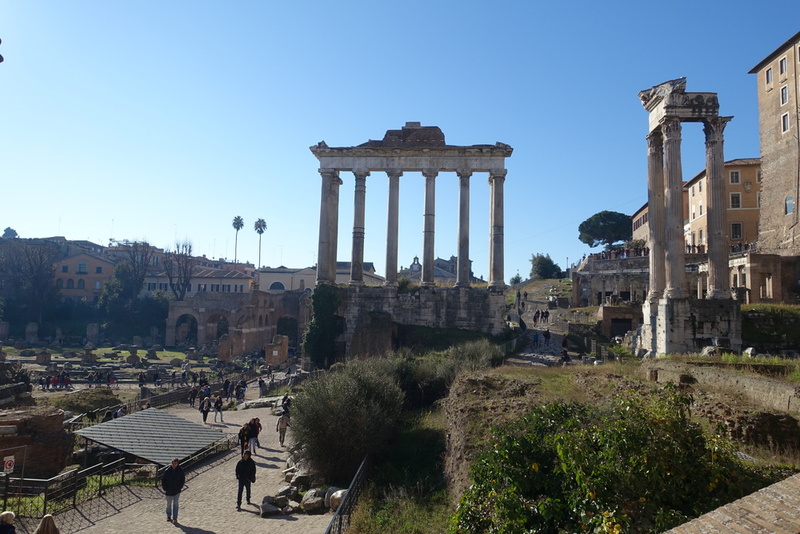 The Roman Forum is, essentially, ruins. Ruins of government buildings, stores, temples, inns, and a marketplace, that was for more than 1,000 years, the most important place in the city. Elections, processions, speeches - they all happened here. It was where meetings took place, where trials were held, and where people traded for goods, among other things - the Forum was the place to be in Rome. And now, not much as changed. Most every tourist that passes through Rome comes to the Forum, or at least walks by it. It has been called the most celebrated meeting place in the world, in all of the history. As we walked around the stone paths, we couldn't help but wonder what it must have looked like back in the day. When everything was just built and not crumbling and just a shadow of what it once was. From the Forum, to the Colosseum! In retrospect, I think a guided tour would’ve been a really good idea. We read the information we had on us and from the few signs that were there, but a more comprehensive explanation of what we were seeing and walking around would have been really neat. I mean, the Colosseum is the largest amphitheatre ever built – and it was built of concrete and sand almost 2,000 years ago! It’s amazing, and again, is one of those places that I would have loved to see at its height. I was really amazed by the fact that it was used for mock sea battles – I mean animal hunts is one thing (those took place there too), but filling it up with water and getting ships inside to duel it out is another. Now that must have really been something. From the Colosseum, we walked through the Piazza Venezia to the Piazza Navona. It's currently the site of three fountains, the most famous being the Fontana dei Quattro Fiumi. It was really gorgeous, but we didn't linger too long, as we were looking for lunch (and we've found that squares popular with tourists aren't usually the best place for reasonably priced food). We found some pizza on our way to the Pantheon, and it probably still stands as the best pizza we had in Italy. It seemed pretty legit, but it wasn't too pricey - Tor Sanguigna is what came up on my credit card statement - so if you're in that area around lunch or dinner and want some quick pizza, we'd definitely recommend it. It's not always easy to find quick, reasonable (not to mention tasty!) food while traveling, so whenever we do, we really feel like we hit the jackpot! The Pantheon, which in Greek meant "every god," served as a temple to all of the Roman gods. Throughout it's almost 1,900 year history, though, it has served a variety of purposes, from Roman temple to tomb to Christian church. It's one of the best-preserved ancient Roman buildings, and especially unusual because its architecture is so different from that of others built at the same time - it still holds the title for world's largest unreinforced concrete dome all these years later, for example. We peeked inside but, SO MANY PEOPLE, so we didn't stay long. To Trevi Fountain we went. I hear that it's the largest Baroque fountain the world, and if you hadn't heard that, then I'm sure you've heard about throwing coins behind your back and into the fountain (if you throw a coin in and make a wish to return to Rome, your wish will be granted or something like that). It's been featured in many movies, and, unsurprisingly, replicated at Disney World. We pried ourselves away from the fountain and walked just a bit to the Spanish Steps, arriving just as it was getting dark. The steps themselves were closed off for a makeover while we were there, but we still got to see them. We read about them at the time, and I read about them a little more while putting this post together, and I still can't figure just why they're so famous. I mean, yes, it's the widest staircase in Europe, but that's not why they're so famous. Things I read claim that they're one of the most romantic places in Rome, which strikes me as a little odd, because this is stairs we're talking about right? Romantic? Maybe if they overlooked Trevi Fountain, but they seem to look over a tourist-laden square, so I don't know. 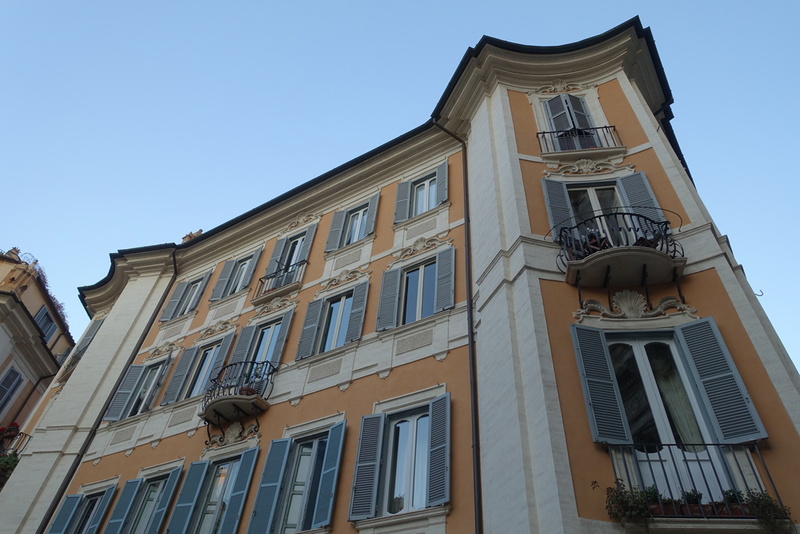 My favorite fact about the Spanish Steps is that the French originally paid for them to be built back in the 17th century, yet they were named after the Spanish embassy that stood nearby at the time. Poor French. The Tiber River isn't far away, so we walked from the steps to the river to see if it would be a nice area to walk around, and perhaps walk along the river for a little ways. The river was pretty, but there weren't really people hanging out around it, so we turned around and went in search of a place we'd seen during the day that looked interesting for dinner. On our way we stopped by Trevi Fountain again to see how it looked at night, and as we might have guessed, it was just as beautiful as it was a few hours earlier. We had dinner at Buddy - during the day they were offering a vegan buffet, but at night they have a standard menu (not vegan - just one or two dishes are). We each ordered different pasta dishes and they were amazing. We still talk about our meal there from time to time - we didn't have many sit down meals on our trip, but that one was probably one of the best - and quite reasonable too! On our way back to our hotel that evening, we passed by the Forum and the Colosseum. It was really neat to see everything lit up as we bid everything ancient Rome adieu. 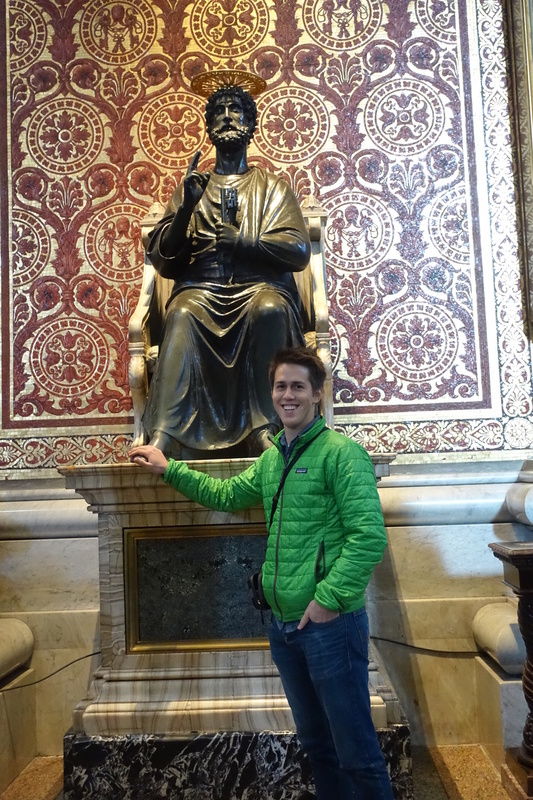 On Monday we (technically) visited another country, the Vatican City, the world's smallest country. It's an eighth of the size of New York City's Central Park at just over 100 acres, and is governed as an absolute monarchy by the pope. We started our day in the city-state in St. Peter's Square, the area in front of St. Peter's Basilica that was designed by Bernini from back in the mid-1600's. We didn't stay long though, as we wanted to go into the basilica before it got too crowded. We went through a quick airport-security like screening (not unlike the ones you must go through for most every other museum/monument/site we've visited in Europe) and entered into the world's biggest church. St. Peter's took 120 years to build, and Catholic tradition says that Peter, one of Jesus' apostles, is buried directly beneath the high altar. In fact, many visitors begin their visit by kissing the big toe of Arnolfo da Cambio's brass statue of Peter that is located to the right of the altar. So if you see a line forming near the statue, and people opposite it with cameras at the ready, this is what it is for. Danny humored me and even took a picture with Peter! In order to see the Sistine Chapel, one must go in and through the Vatican Museums, which really isn't a bad thing at all. Even though we were there at the end of December (the off-season, perhaps? ), we still had to wait in line for over two hours just to buy tickets. Meanwhile, Danny ran down the street to buy a box of pizza (we both agreed it was some of the worst we've ever had, but it was lunchtime and we were desperate) while I held our place in line. My recommendation would be to go to the Vatican Museums first thing in the morning - as soon as they open (or before they open) get in line, so you don't spend hours in line just trying to buy tickets. Then, take your time at the museums and go to St. Peter's Basilica when you're finished. Sure, it may be a bit more crowded than if you'd gone early in the morning, but it will be crowded no matter what. One suggestion for beating the crowds I've heard is to get to the church at 7am when it opens, then go to the Vatican Museums when they open at 9:30am. I think this is actually a great plan...if you're able to get up (really) early...and maybe sneak an afternoon nap, too, especially if you're visiting at a busier time of year. Back to the Vatican Museums, though. Once we got inside, we followed the signs for the Sistine Chapel, as that was what we wanted to see the most. You must go through many galleries and follow a specific pathway in order to reach it, but eventually, you will. We saw some really amazing things on the way though. Take a peek, since no pictures are allowed in the Sistine Chapel itself. Being in the Sistine Chapel is an experience in and of itself. Silence is requested by signs and by the guards commanding it over the loudspeaker every couple of minutes ("SILENZIO. SILENCE. NO PHOTO.") yet it's fun to look around and see just how many people are daring to hide their phones in their jackets or behind their friend to try to sneak that coveted photo of the ceiling. One thing we were a little surprised by was how small the painting of Adam and God reaching out to touch each other's finger is. I think I expected it to be the main focal point of the painted ceiling, like 3 or 4 times bigger than everything else (or maybe even the only thing on the ceiling?) but it's really just the same size as all of the other scenes. I'm still impressed that Michelangelo painted A CEILING in four years (1508-1512), standing on a scaffold, not laying down, with his head tilted upwards the entire time. Apparently, he was extremely uncomfortable the entire time, and even though before beginning he made it clear that he wanted to decline the project, today the ceiling stands as a cornerstone of High Renaissance art. We spent the next few hours walking through different Vatican Museums, none nearly as crowded as the ones that funnel into the Sistine Chapel. We saw quite a bit of religious art, many sculptures, tapestries, and perhaps the most unique, the Popemobiles. The Carriage and Automobile Museum displays many of the carriages and cars used by popes throughout the years, and we found it so interesting, especially the more recent additions. We stayed at the Vatican Museums nearly until closing time, which was 4pm, and then decided to get dinner and, afterwards, gelato, in the area. We picked a place that was touristy enough for English translations on the menus, but not too hard on our budget. Still not sure I'd necessarily go out of my way to recommend it (or the gelato place). They were good, but nothing special, nothing you couldn't find wandering the streets of Rome by yourself. Rome was so quick. We packed it in, from morning till night, and we saw a lot. If it was lighter later into the evening (i.e. summer), I think we would've tried to do even more, but alas, winter had its way. There's no question we're glad we went. Rome is so famous, so iconic, so important to world history. We ate (mostly) great food, we saw amazing sights, and we looked at beautiful art. 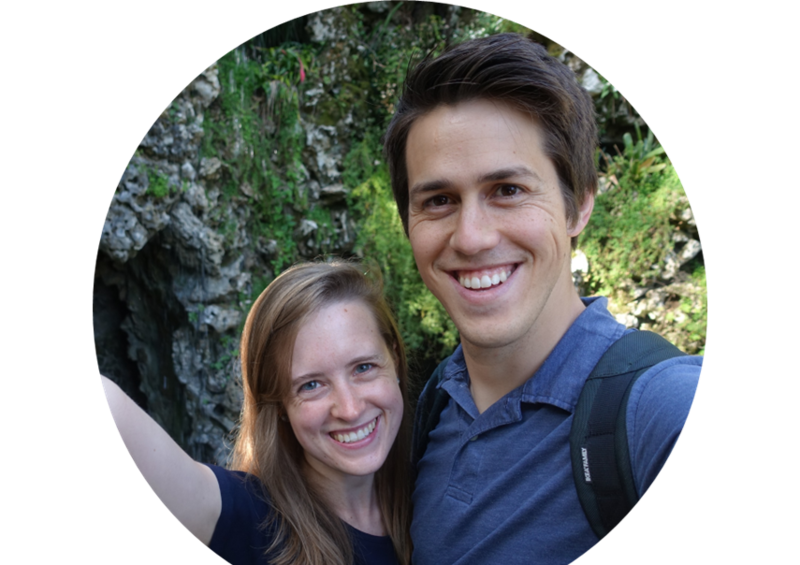 Because our time there was so short, we (inadvertently) saved a few things to do if we ever go back - although to be honest, I don't know if it's at the top of either of our lists, save for a lingering visit to Trevi Fountain and a meal at Buddy. And briefly, I think I expected more of the ruins (at the Roman Forum specifically) to be intact. I think I expected to see more "ancient Rome." Perhaps I just thought we would be walking around Rome and see remnants of ancient Rome everywhere! (Yes. I may have thought that.) Isn't it goofy how so much of travel (and life, really) can come down to expectations and how they are met...or not? I mean, if I knew nothing of Rome and just showed up, I think I would be so wowed by getting to see structures that are nearly 2,000 years old and still standing! I wouldn't think about what was missing and what had been lost over the years or what I had expected would be there, I would just be happy with what was there. The warm weather was a very welcome addition to our travels, as Belgium, Germany, and Austria had been rather cold and every day (except for in Bruges, and that was probably a mistake) we found ourselves wearing two heavy jackets. It was in the high 50's both days (Fahrenheit - we're really struggling to convert to Celsius!) which was a great transition because very early the next morning we flew to the beautiful island country of...MALTA!